Looking for help using Marketing Agency Finder? Start with these frequently asked questions. Can I search for creative services as well as marketing services? Absolutely. Marketing Agency Finder features creative and technical specialists in every category of business growth and promotion – from creative design and photography to website and application design to video production and talent. How do agencies get listed on Marketing Agency Finder? Agencies can join Marketing Agency Finder here to put their listing in front of companies from every industry and in every state across the nation that are looking for creative and technical specialists to help them overcome the challenges of growing and promoting their business in today’s marketplace. Is there a fee to use Marketing Agency Finder's services to find an agency? Never. In order to help you find the most qualified creative specialists to help you grow and promote your business, Marketing Agency Finder gives you unrestricted access to search for agencies, compare agency profiles, ratings and reviews, and peruse the Portfolio Browser and MAF Magazine without ever paying a fee or signing up for an account. What is Marketing Agency Finder? From artists to web developers, finding the best creative partner to help you grow and promote your business was never possible until now. Marketing Agency Finder is the first marketplace of its kind designed to let companies like yours search for marketing, creative and technical specialists based on the exact criteria you choose – from location and services to client satisfaction and industry expertise – and get real, verified ratings to help you make the single most important decision in the life of your business. What types of services can I find on Marketing Agency Finder? From the creative to the technical to the tactical, if there’s a specialist you need to help you grow and promote your business in today’s marketplace, you’ll find them on Marketing Agency Finder. MAF encompasses agencies with proven expertise in everything from branding and PR to web, production, search, social and more. If you’re looking for other types of services to help you build and run your business, visit Business Services Finder to search for specialists in accounting, legal services, human resources, IT and much more. 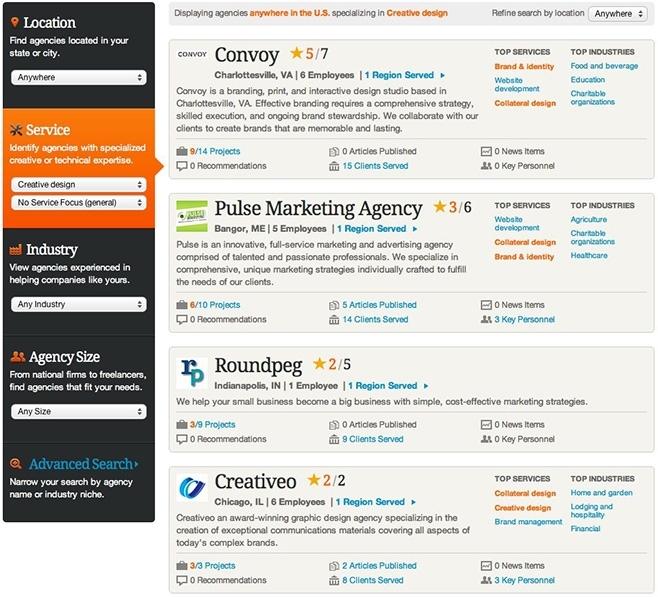 Find an Agency: Marketing Agency Finder is the only place where you can search for creative specialists based on the exact criteria you choose – from location and services to client experience and industry expertise – and easily compare ratings, recommendations and portfolios in one consistent, streamlined view. Portfolio Browser: Search our creative library to find projects that inspire you and connect with the agencies that created them. MAF Magazine: Find out who’s truly the voice of authority in their field and put them to work for your business. Your search criteria may be too specific. Try broadening your search to find an agency that meets your needs. Remember, new agencies are joining Marketing Agency Finder every day, so if you didn’t find exactly what you’re looking for today, check back again soon. How can I find an agency in my area? Search by location to view agencies located in your city or state. For even more options, broaden your search to include all agencies in your geographic region. How can I find an agency that's worked with a company like mine? 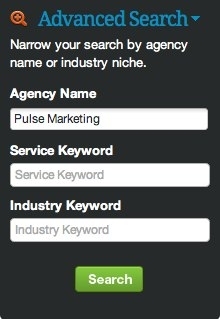 Simply use the Industry search option to view agencies with proven experience in helping companies like yours. How do I contact an agency? Just visit the agency’s page and click the green Contact button to send a message to that agency requesting more information. I want to work with one agency that can meet all of my marketing and creative needs. How can I use Marketing Agency Finder to find a firm that offers a broad array of services? When searching for an agency, choose one of the integrated agency options located under the Services menu, and then select the specific services you need to find only those agencies that have proven experience in every area you’ve identified. I'm looking for a freelancer. Can I find one on Marketing Agency Finder? Absolutely. You can find all types of creative specialists, from major national firms to professional freelancers and everything in between. 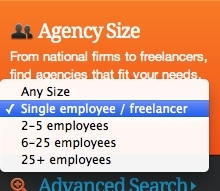 Just narrow your search using the Agency Size option to find the right fit for your needs. If I find an agency, do I have to work through Marketing Agency Finder to request a bid or retain services? No – not at all. Once you’ve identified the right match, you’re free to contact and hire that agency on your own terms. You’ll never pay a fee or commission to Marketing Agency Finder. Can I submit an article to MAF Magazine? Only member agencies of Marketing Agency Finder can submit articles for publication in MAF Magazine. With insight and inspiration delivered daily from seasoned agencies and creative professionals across the nation, MAF Magazine is your essential resource for the marketing and business growth intelligence you need to compete and win in today’s marketplace. How can I see a specific type of work in the Portfolio Browser? There are many ways you can search the Marketing Agency Finder Portfolio Browser to find the projects that are most relevant to your interests. What is the Portfolio Browser? The Portfolio Browser is a collection of all types of creative projects published by our member agencies, from audio production to website design. It’s a great resource for finding ideas and inspiration as well as identifying agencies that produce the best work in their field. Can I search for a specific agency to find their Marketing Agency Finder rating? Yes. 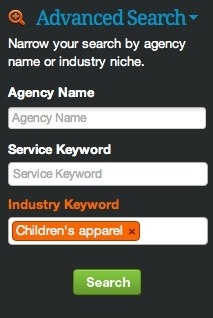 Use the Advanced Search options to search by agency name. To protect the integrity of our rating system, every client recommendation is reviewed and approved by Marketing Agency Finder’s staff to ensure that it represents an authentic testimonial from a client who has experience working with that agency. What does the Marketing Agency Finder rating mean? Marketing Agency Finder takes all of the essential elements that qualify an agency’s experience and expertise – including recommendations from their clients, projects in their portfolio and articles they’ve published – and combines them into one simple, streamlined rating system that makes it easy for you to compare agencies side-by-side to see how they measure up. Why does each agency in my search have two ratings? What do these numbers mean? The first number represents a rating of that agency’s qualifications based on your search criteria.